Have you ever thought about using a toy to teach your child how to code? The Wonder Workshop Dash Robot Wonder Pack is one of the hottest coding toys on the market right now. It’s won numerous awards, and everyone seems to be talking about it. Of course, you probably have a few questions. Does it work? Will it hold your child’s attention? Is it difficult to use? And does it really teach coding skills? And, most importantly, does it live up to the hype? These are a few of the things you need to know before investing in the Wonder Workshop Dash Robot Wonder Pack. What Is the Wonder Workshop Dash Robot Wonder Pack? The Wonder Workshop Dash Robot Wonder Pack is an award-winning playset that teaches children coding and problem-solving skills. The pack consists of two interactive robots known as Dash and Dot. Dash is the more mobile, hyperactive robot while Dot is considered the brainier of the two. Once you download the free apps, you can play all sorts of games and solve a variety of puzzles with these two charming robots. This pack comes with the Dash and Dot robots, charging cords, building brick connectors, a bulldozer, a tow hook, a launcher and balls, a bunny ears and tail set, target stickers, and a xylophone. It also has two lithium-ion batteries already included. Please be aware that you’ll need at least an iPhone 4S or higher to download the apps. Make sure you check out their official website to see if your device is compatible. Naturally, there are a few things you need to know about the Wonder Workshop Dash Robot Wonder Pack. Here are a few of the most frequently asked questions. One of the best things about the Wonder Workshop Dash Robot Wonder Pack is that you can play with it in a wide variety of different ways. It works with five free downloadable apps. These are Wonder, Go, Path, Xylo, and Blockly. Wonder allows you to program the robots with several different behaviors. This gives your child a good introduction to robotics and engineering. Go is the most simplistic of the five apps. This lets your child move and make sounds with Dash by using their thumbs. It’s a great way for younger children to start playing with their new robot friends right out of the box. The Path app introduces children to sequences, events, and sensors. With this app, your child can lead Dash on a fun adventure with a simple draw, drag, and drop interface. The Xylo app lets kids compose their own songs by using command sequences and loops. Finally, Blockly is a more complex app that teaches children some programming skills. It allows you to program several different behaviors such as dancing and playing tag. As you can see, there are numerous ways to play with the Wonder Workshop Robot Wonder Pack. This is one of the toy’s greatest strengths. Children of all ages can easily spend hours exploring everything these robots can do. Does it really teach coding? The answer is yes. Many customers who use coding in their own work found this to be the best toy for teaching STEM skills. It’s an entertaining, engaging way to teach children a skill that will last a lifetime. It gives kids a vast array of challenges that are simple and easy to understand. Even children who are opposed to learning coding skills absolutely loved playing with it. On top of this, the Wonder Workshop Dash Robot Wonder Pack has won several awards for its educational value. These include the Oppenheim Toy Portfolio Platinum Award, Good Housekeeping’s 2015 Toy of the Year, and the 2015 National Parenting Publications Gold Award. Is it appropriate for all ages? For the most part, the Wonder Workshop Dash Robot Wonder Pack is appropriate for all ages. Wonder Workshop recommends it for ages six and up. It does have a few small parts that could be a potential choking hazard. Also, it might be a bit too advanced for very small children. Aside from that, children in many different age groups can enjoy this toy. Smaller children can have fun with simpler activities such as the Go app. Meanwhile, older kids will enjoy diving deeper into it’s more advanced functions. The Wonder Workshop Dash Robot Wonder Pack provides an incredible number of challenges for children to play with. That makes it a toy that kids can enjoy for many, many years. Most customers have absolutely loved these little robots. It teaches coding skills in a way that’s fun and engaging, and the sheer number of things you can do with it leads to hours of replayability. Many teachers have used it in their classrooms, and it’s been an absolute hit with their students. Furthermore, kids of almost any age can find ways to enjoy it. You really can’t go wrong with the Wonder Workshop Dash Robot Wonder Pack if you have a child that’s already interested in robots. Unfortunately, there is one major issue. A few customers have had problems with the robot malfunctioning after owning it for less than a year. In these cases, the robot won’t turn off until it dies, and it won’t hold a battery charge. Although this isn’t a common problem, it has happened to more than one person. A few customers also had difficulty setting it up. It doesn’t come with any instructions. However, the apps do have tutorials. The Wonder Workshop Dash Robot Wonder Pack will cost between $215 and $300. This might seem like a lot of money at first glance. However, it’s actually fairly reasonable for a robotic toy. This is especially true when you consider everything the Wonder Workshop Dash Robot Wonder Pack can do. Some of the more advanced robots out there will cost nearly $1,000. You can buy this toy on Amazon or its official website. Many other sites that sell toys also carry the Wonder Workshop Dash Robot Wonder Pack. You can also buy it at Walmart and almost other any place where toys are sold. We gathered most of the basic features and information about these toys from Amazon and their official websites. We based our opinions on customer reviews from sites such as Amazon. When reviewing these products, we chose to focus on aspects such as quality, price, ease of use, replayability and educational value. We also considered how fun and engaging these toys were for children. Finally, we took the recommended age ranges into consideration. Of course, this isn’t the only coding toy on the market. How does the Wonder Workshop Dash Robot Wonder Pack compare to its competition? Kids help Cubetto, a friendly wooden robot, find his way home using hands-on blocks to write their first programs. Montessori and Logo Turtle-inspired, Cubetto makes programming accessible to children before they can read or write. The Primo Cubetto Playset is another robot-based coding toy. In this case, you place a robot named Cubetto on a mat and help it find its way home. You do this by using an interface board and coding blocks. It comes with the robot, interface board, 16 coding blocks, a playmat, and a storybook. You can buy other mats and books separately. Primo recommends this toy for ages three to six. Customers have absolutely loved the Primo Cubetto Playset. Parents and children have both had a ton of fun with it. Unlike the Wonder Workshop Dash Robot Wonder Pack, this toy doesn’t require any apps or smart devices. It’s also very effective at teaching coding skills. Most of the complaints are relatively small. The mat bunches up occasionally, especially if you’re playing on the carpet. The main complaint is the price. It’s going to cost between $200 and $300. Although this is comparable to the Wonder Workshop Robot Wonder Pack, it doesn’t do nearly as much. You would expect more than one playmat for the amount of money you’re spending. Also, older children might get bored with it quickly. Still, the fact that you don’t need an app might be a major selling point for some. Amazon gives it 4.6 out of 5 stars. 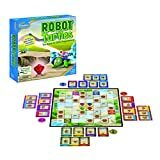 Robot Turtles has won several awards and became the best selling board game in history on Kickstarter. It comes with a board and several cards that are based on coding commands. These include left, right, and forward. There’s also a Bug card you can use if you make a mistake. The goal is to use the cards to help your turtle find the jewel. Think Fun recommends this game for ages three to eight. Customers enjoyed this game because it’s simple and easy to get started. It doesn’t require any apps or smart devices. It’s also very effective at teaching coding skills. Unfortunately, its simplicity can also be a detriment. Many customers felt it didn’t hold their children’s attention for very long. This is especially true if you have older kids. It doesn’t offer much regarding replayability. Luckily, you won’t have to spend too much money on it. This will typically cost between $10 and $30. This is obviously much cheaper than the Wonder Workshop Dash Robot Wonder Pack. However, you have to question how long your child will stay interested. It might be worth it if your kids love board games. Otherwise, you might want to invest in something more engaging. This game has 4.1 out of 5 stars on Amazon. 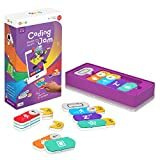 The Osmo Coding Jam works by combining coding skills with music. It comes with a set of 23 coding blocks. These blocks represent different coding sequences. When you place your iPad in the Osmo base, you can arrange the blocks in a variety of patterns to create different beats and melodies. Please be aware that the Osmo base is sold separately. Osmo recommends this toy for ages 5 to 12. Many customers felt this was an incredibly fun and engaging toy for their kids. It’s really a no-brainer if your child loves music. This is especially true if you have older children. Kids can easily spend hours programming their own songs. However, some customers felt the coding itself was a bit too simplistic. Although it’s effective, it could be a lot deeper. The Osmo Coding Jam will cost between $30 and $80. Again, it’s much more affordable than the Wonder Workshop Dash Robot Wonder Pack. It’s also very engaging in its own right. A lot of this will depend on your child’s personal preferences. If they love music, you should probably go with the Osmo Coding Jam. If they’re more interested in robots, you might want to stick with the Wonder Workshop Dash Robot Wonder Pack. Amazon gives this toy 4.6 out of 5 stars. There are a lot of things to like about the Wonder Workshop Dash Robot Wonder Pack. It’s fun, it’s educational, and it’s reasonably priced. On the downside, a few customers have had trouble with it malfunctioning in a relatively short amount of time. It also doesn’t come with any instructions and can be somewhat difficult to set up. The Wonder Workshop Dash Robot Wonder Pack has tons of replayability and appropriate for most ages, However its difficult to set up sometimes. Osmo Genius Kit Game System for iPad: Hope or Hype?